“When we pray the Lord’s Prayer, observed Luther, we ask God to give us this day our daily bread. And He does give us our daily bread. He does it by means of the farmer who planted and harvested the grain, the baker who made the flour into bread, the person who prepared our meal. We might today add the truck drivers who hauled the produce, the factory workers in the food processing plant, the warehouse men, the wholesale distributors, the stock boys, the lady at the checkout counter. Also playing their part are the bankers, futures investors, advertisers, lawyers, agricultural scientists, mechanical engineers, and every other player in the nation’s economic system. All of these were instrumental in enabling you to eat your morning bread. Gene Edward Veith Jr., God at Work: Your Christian Vocation in All of Life, Illinois:Crossway, 2002, pages 13-14. It is only a sovereign God as sovereign who can and does employ the means as well as the ends to accomplish all that occurs in the universe. Our only response should be praise to God that he would use our meager vocations and skills to do something far greater than we can ever imagine. Amen to everyting you have said, Paul. In my case, I will confess that this doctrine encourages me to press on in the seemingly mundane and inconsequential tasks. So often we long for something greater but fail to bring Him glory in the place that He has us. Bless God for the grace that makes us willing and then empowers us! When my husband and I first became Christians, we considered going into ministry. He was in optometry school at the time so it would be a big change. As we prayed, however, God showed us that we could best serve Him by helping others with their vision needs. It was the right decision and we knew God had called my husband to this work. 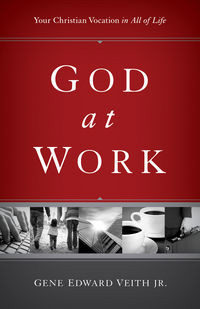 Every job, when directed by God, is a ministry in itself if we are dedicated to serving Him. We are the hands and feet of Jesus wherever we are placed if we are willing to serve Him. Thanks for sharing this today. Beautiful! So many believers separate their spiritual lives, activities, blogs, etc. from the rest of their existence. This points beautifully the other way around and to God in whom we move and have our being – all of it! Love and blessings! !